THE woman in front of me has a 1950s dress splashed with bright red flowers, I think she’s got the dress code right. So much more appropriate than my own nautical stripes. Because a seaplane is a glamorous way to travel. The whole experience is a throwback to the days of the old flying boats when travel was a more languid, more luxurious experience. It deserves a flowered frock. Sydney Seaplanes’ new Empire Lounge at the Rose Bay terminal certainly emphasises this idea. The luxurious lounge is named in honour of the 1938 planes, and Australia’s first purpose built seaplane terminal has a flying boat museum as well as a leisurely check-in and a discreet VIP area. We sit in wicker chairs sipping champagne as we watch tiny planes skit like insects over the sparkling Sydney water. Each arrival is met with a frisson of excitement from waiting guests who straighten slightly in their chairs, wine glasses paused mid-way to mouths: “is this ours”? We’re heading to Palm Beach for an a la carte four-hour lunch at Jonah’s, accompanied by matching wine handpicked by the new head sommelier Niels Sluiman. The restaurant is a Palm Beach legend, beloved of the PB social set and a whole glitterati of visiting celebrities have also eaten here. However, today I am as excited about the journey as I am the destination. 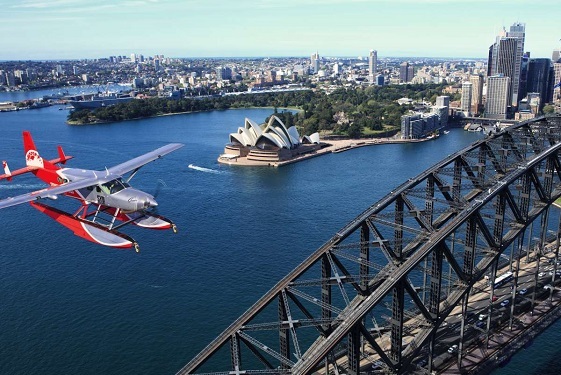 Taking a seaplane flight has to be the ultimate Sydney experience. This city is all about beaches and blue water and what better way to get a drone’s-eye view of it all than in your own private plane. As we take off from Rose Bay we taxi past the windows of some of Sydney’s most expensive real estate –and then we’re air born. Below us the bay glitters sapphire-bright in the morning sun and not even a purple cloud or two and the warning of later showers can dim the beauty of this harbour city. As we fly up the coast, the Northern Beaches are a ribbon of yellow between what is a surprising amount of green (for a built up city) and the ocean. Homes are dainty as doll-houses below us, their pools tiny beads of blue. The forty minute flight goes too quickly and before we know it we’re wheeling around like a pelican coming into land and gliding gracefully towards a waiting boat. We disembark at a little wooden jetty and are whisked up the hill by private transfer. Minutes later I have a glass of chilled Pinot Gris in my hand and I’m already trying to decide between the Wagu beef and the Bass grouper. No easy choice when the menu is as good as the one that executive chef Logan Campbell creates. The views from Jonah’s are also pretty special and our window table looks right down onto the beach. We eat so much good food I am a little concerned that the plane won’t actually be able to take off again. The highlight of the return trip is a scenic swoop over the Sydney Opera House and the Harbour Bridge. An exhilarating end to a wonderfully extravagant day. You can also have dinner a Jonah’s with a one way scenic flight and a chauffeur transfer back. Or for the truly indulgent there is an overnight Fly & Stay package which includes Return seaplane flights and transfers, a 3-course a la carte dinner (beverages not included), accommodation in an Ocean Retreat room and breakfast the next morning.